Info taken from the liner notes written by Dave Wynn for "Jungle Drums" album released in 1965. Additional information provided by Tertius Louw. "The fusion of conventional western-world melodies and lyrics with pulsating African tribal rhythms as perfected by South Africa's top group. 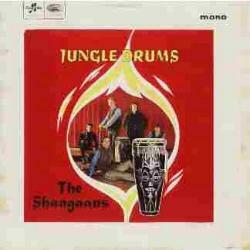 The Shangaans represents one of the most exciting out-of-the-rut sounds ever heard on the British music scene. After hitting the highspots throughout South Africa, the five-strong Shangaans arrived here in the summer of 1965 and immediately clicked in a big way with fans via two big-selling singles - Genzene and The Click Song. 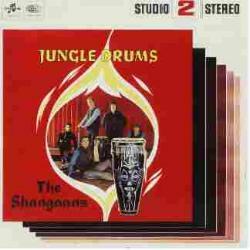 Now comes their first album and the overall title 'Jungle Drums' aptly summarises their unique, highly individual style of exotic, percussion-based pop music. The use of stereophonic sound greatly enriches the never-ending cross-pattern of percussive sounds from a wide variety of authentic African instruments including chopi piano, kalimba, and any amount of big and small tribal drums. Stereo sound, in fact, has never been put to greater or more effective use in pop music, and the added depth and clarity that automatically comes with the use of this technique greatly aids the overall success of this debut album by The Shangaans. Although basically an instrumental set - with such highspots as the throbbing revival of the Lou Busch favourite, Zambesi, and the kwela-flavoured Afrikaan Beat - The Shangaans, nevertheless, are accomplished singers, too, and show their paces in fine style on The Lion Sleeps Tonight (perhaps better known in some quarters as Wimoweh), Ntjilo Ntjilo and Jikal 'Emaweni." Zambesi was composed by the well known South African composer and bandleader, Nico Carstens. "Who are The Shangaans? Their names are Grahame Beggs, Alain Woolf, Mark Barry, Bill Muller and Glen "Tich" Muller. They represent the cream of the South African scene, since all five have made their mark in past with other leading groups. Individually, they are brilliant musicians: collectively, they make a remarkable, multi-talented outfit." Alain previously played with the Stereos. Grahame came from the Blue Jeans and the two Muller brothers from the Meteors. Alain replaced Johnny Dean as lead vocalist when the outfit moved to England. Dean, a UK citizen, came to South Africa and recorded an album with the Apaches prior to his stint with The Shangaans. Cover scans from the personal collection of Tertius Louw, May 2001.